When you’re an expat, friends and family often come to visit. While living in Brazil we could send our guests to the beach. In Alaska however, you need to make a detailed program, because you cannot just send them out in the woods to be attacked by a moose or a bear. When people travel all the way to Alaska, they often stay for several weeks. Since the weather can be unpredictable, you need to stitch together a full program, both for outdoor and indoor activities. In June, our summer house neighbors in Norway decided to pay us a visit and suddenly I kind of panicked. We had often had guests both in Rio de Janeiro, Cape Coral and Houston. In these places people want to be on the beach, tan by the pool or shop, but here…! I cannot say this is either an eldorado for shopping or sun tanning, even if we have an electrical tanning bed in the garage. On the other hand, guests give you an opportunity to explore more of the new place in which you live. 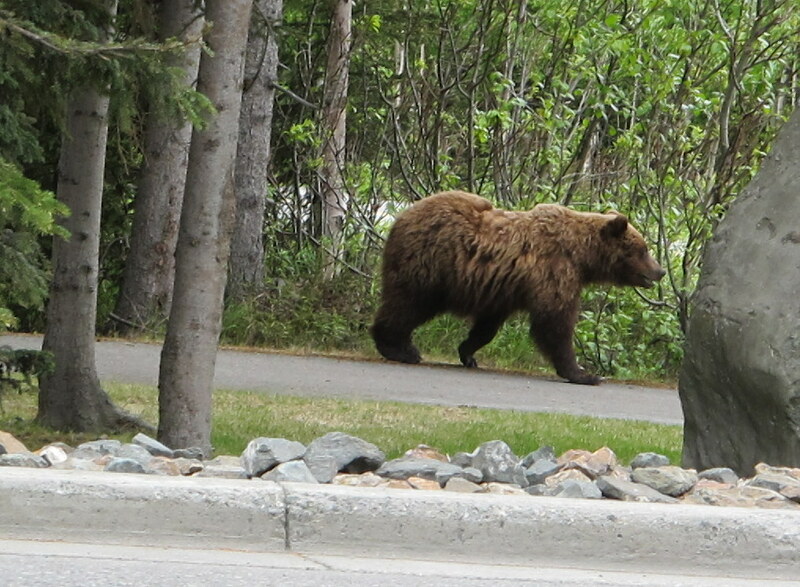 Only 10 hours after Ellen and Frank arrived in Anchorage, they saw a big grizzly bear not far from our house. When we spotted the bear, they shouted so loudly I nearly drove off the road. Unfortunately he had just killed a llama at a petting zoo close to our subdivision, and after a stroll he was getting back for more to eat. We were actually on our way to an outdoor market with art, souvenirs, clothes and whatever you can think of. A market that is colorful from A to Z, with Native art on one end of the scale and exotic belly dancing on the other! For lunch we had caribou quesadilla – exotic enough for most people! When you have guests in your house 24/7 for weeks, you need a little window for yourself to recharge your batteries and get some inspiration. I had been trapped in my own availability once before and I didn’t want that to happen again. I emailed Ellen in advance and said she was very welcome to join me for zumba every morning. She brought her training gear – and guess what: she got hooked after the first stroke of Latin beat! I really don’t know who was the happiest; me, Ellen or her husband who could enjoy a quiet morning with his book and his coffee. It was quite amazing, because I had never experienced better weather than the weeks they were here. Almost every day we were hiking in beautiful state parks with chiming bear bells dangling happily from our belts, or climbing the highest peaks, while spending the afternoons on our deck in the sun sipping white wine. Amazing. We went to a small town called Soldotna for salmon fishing, where we had rented a cozy log house by a lake. At 5 am the next morning we were ready for the great bite. 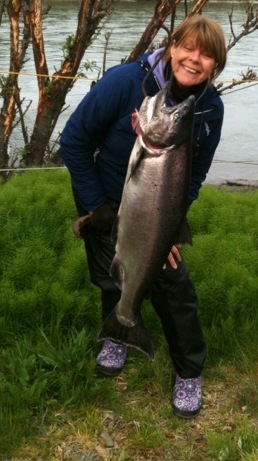 After an hour in the strong currents of the Kenai River, Ellen got a 12 kg big salmon! Is it possible to be that lucky? No one else in the boat could feel a single pull the whole day. But it didn’t really matter, because the Irish captain was like a stand-up comedian with a well of jokes and funny stories. Maybe we scared off the salmon by laughing too much? The last weekend we planned a roundtrip with car and ferry. However, on our way to Whittier, we had to share the tunnel with a train! Luckily we understood which lights were ours and not the train’s. We got through safe and sound without being run over. After boarding the ferry we were driving past walruses, sea otters, seals and whales with several bold eagles hovering in the sky. What a sight! A not so nice place in the Prince William Sound was the spot where The Exxon Valdez ran aground and ruined the environment for decades, with the spilling of more than 11 million gallons of crude oil – an incident never to forget! Valdez, on the other hand, was a nice little town with charming restaurants and bars, especially the Fat Mermaid, which gave you a feeling of the gold rush era with its rustic interior. We drove the most scenic route back to Anchorage, through narrow valleys with great waterfalls and over high mountains, with mountain goats grassing in the steep hillsides. The nature in Alaska is overwhelming, like it’s on steroids, and the colors are the brightest and deepest you can imagine. God must have been in a good mood while creating this part of the world! However, there was one thing that bothered our guests, they hadn’t seen a single moose, even though they had already experienced more than most people during a lifetime. But not for long. At 4 am they woke us up because people were screaming outside their window. We rushed to their room and removed the blackout curtains you need this time of the year – when the sun is shining around the clock – and saw the biggest moose ever eating the neighbors’ most precious trees. The whole family was screaming and shouting like crazy while swinging towels like whips, but the moose didn’t move. He just looked at them and chewed on. Our visitors could finally write; “check” on their only remaining wish, just hours before the plane took off. Lucky guests!